Those of us in IT have been using “agile,” a flexible methodology that improves software development, for quite some time. We like agile because it speeds up the development process and a whole lot more. So I suppose it was only a matter of time before smart business leaders realized the potential of agile to help other parts of their organizations to quickly adapt to changing conditions. That’s the topic of the current Harvard Business Review cover story, “Agile at Scale: How to create a truly flexible organization” by Darrell K. Rigby, author of Winning in Turbulence; Jeff Sutherland, a co-creator of the scrum form of agile innovation; and Andy Noble, a partner in the consulting firm Bain & Company. It’s a good read and a terrific overview of how hundreds of companies are working now to integrate agile principles into their operations – from startups to multinational corporations. What’s happening with agile now reminds me of the Wild West days of the Internet and, later, that other amazing innovation we all take granted today: websites and e-commerce. As organizations sought to harness those tremendous new technologies to reach suppliers, potential employees and, most importantly, customers and prospects, there were missteps, miscalculations and missed opportunities. There were also incredible winners and innovators that evolved “e-commerce” into today’s brave new world of The Internet of Things (IoT) and even Artificial Intelligence (AI). Ah, yes, the challenges of learning to walk before we run. Always a daunting challenge and yet the rewards of agile are numerous and well-documented: “higher team morale and productivity, faster time to market, better quality and lower risk than possible with traditional approaches.” Agile companies also stay closer to customers and adapt more quickly to changing conditions. 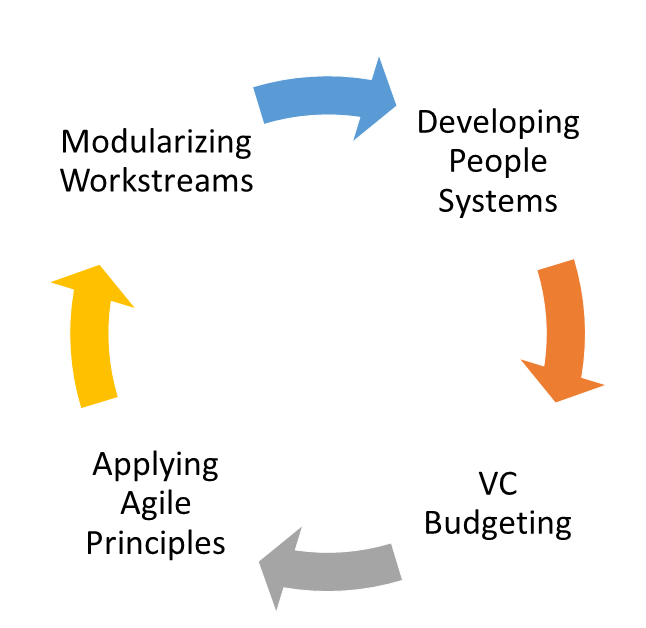 Apply agile values and principles throughout the entire organization to ensure progress not partisan gridlock between agile workers and those still operating under the older “traditional” modes of operation. Workstreams should be modularized and then seamlessly integrated. Develop systems for acquiring star players and motivating them to make teams better. Combine your annual budgeting process with a venture-capital-like approach. Sticking to a strict annual budget process is the kiss of death for new ideas and approaches! That’s a lot to digest. But, in a nutshell, think about agile implementations like an unfolding Slinky: unfolding one link at a time until the entire spiral is engaged. Just make sure it doesn’t develop a kink – like bureaucratic systems that resist innovation – or the Slinky will stop dead in its tracks. Why go slow if agile promises big benefits? “Big-bang transitions are hard. It’s often better to roll out agile in sequenced steps, with each unit matching the implementation of opportunities to its capabilities,” note HBR’s distinguished experts. But don’t go too slow or you might just miss the agile revolution. Remember Friendster, Napster or Netscape? Don’t worry, neither does anyone else.